I've heard a lot about Cascade Brewing out of Oregon, but I'd always figured them for one of those breweries I'd never actually see (except maybe in a trade, now that I've popped that cherry). They apparently do a brisk business selling beer online, but because PA has the dumbest beer laws ever, they do not ship here. Fortunately for me, bottles have started to show up in the Philly area through regular distribution channels, which is a very welcome development. I picked up this Kriek a few weeks ago and will now be keeping an eye out for their other "regular" beers... And at this point, I might need to orchestrate a shipment of Cascade beer to some readily accessible Delaware residence, cause this stuff is just great. Beer Nerd Details: 7.62% ABV bottled (750 ml caged and corked). Drank out of a tulip glass on 3/22/13. Label sez: 2011 Project. Alright, so riddle me this: the name of the beer is Kriek, but this isn't spotaneously fermented lambic. 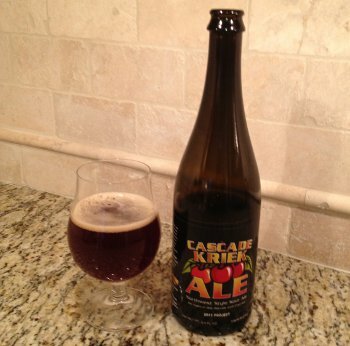 Cascade also calls it a Northwest Style Sour Ale, which to me means that it would fall under that American Wild Ale category... but then BA has it as a Flanders Red Ale (which, actually, works well enough I guess, as this fits well with that style). I know, whatever, who cares, this is just great beer and yes, I'll be getting more from them and am I still writing? I should stop now and start masterminding the great beer heist of 2013 (yeah, this is a grandiose description of ordering beer online, but work with me here). Update: Ah crap, they don't ship to Delaware or even New Jersey, which pretty severely limits my options. I guess it's left to trades then. To be fair, Kriek just means cherry and doesn't really imply anything about the sour. I guess if it's a bit sweeter then Flanders Styel Red Ale makes sense. It's also possible the base beer is the result of the style choice. I have been longing for Cascade for awhile now. I had no idea they sold online. I may have to get me some. Although, at those prices and with shipping, I'll probably have to get it as a present. Father's Day isn't till June...maybe I'll treat myself to a nice Earth Day present. I know, right? On the one hand, I'm a little glad the option isn't available, as I have no control over spending when it comes to stuff like this. On the other hand, I just found out that a coworker lives in Maryland and is willing to mule the beer up here if I send it to their house. Looks like the great beer heist is on! This page contains a single entry by Mark published on March 25, 2013 8:58 PM. Evolution Bourbon Barrel Dark Ale - Winter Migration 2012 was the previous entry in this blog. HaandBryggeriet Dark Force is the next entry in this blog.